Clustering in vehicular ad hoc networks (VANET) is one of the control schemes used to make VANET global topology less dynamic. Many of the VANET clustering algorithms are derived from mobile ad hoc networks (MANET). However, VANET nodes are characterized by their high mobility, and the existence of VANET nodes in the same geographic proximity does not mean that they exhibit the same mobility patterns. Therefore, VANET clustering schemes should take into consideration the degree of the speed difference among neighboring nodes to produce relatively stable clustering structure. In this paper, we introduce a new clustering technique suitable for the VANET environment on highways with the aim of enhancing the stability of the network topology. This technique takes the speed difference as a parameter to create relatively stable cluster structure. We also developed a new multi-metric algorithm for cluster-head elections. A simulation was conducted to evaluate our method and compare it with the most commonly used clustering methods. The simulation results show that our technique provides more stable cluster structure on the locale scale which results in a more stable network structure on the global scale. The proposed technique reduces the average number of clusters changed per vehicle by 34-46%, and increases the average cluster lifetime by 20-48% compared to the existing techniques. Recent advances in wireless networks have led to the introduction of a new type of networks called vehicular ad hoc networks (VANETs). This type of networks has recently drawn significant research attention since it provides the infrastructure for developing new systems to enhance drivers' safety [1–3]. Equipping vehicles with various kinds of sensing devices and wireless communication capabilities help drivers to acquire real-time information about road conditions allowing them to react on time. For example, warning messages sent by vehicles involved in an accident enhances traffic safety by helping the approaching drivers to take proper decisions before entering the crash dangerous zone [4, 5]. Moreover, information about the current transportation conditions facilitate driving by taking new routes in case of congestion, thus saving time and adjusting fuel consumption [6, 7]. In addition to safety concerns, VANET can also support other non-safety applications that require a quality of service (QoS) guarantee. This includes Multimedia (e.g.,audio/video) and data (e.g., toll collection, internet access, weather/maps/information) applications. Vehicular ad hoc networks (VANETs) are characterized by high vehicle mobility. Due to high mobility, VANET topology changes rapidly, thus, introducing high communication overhead for exchanging new topology information [8, 9]. Several control schemes for media access and topology managements have been proposed [8, 10, 11]. One of these schemes is establishing a hierarchical clustering structure within the network. The clustering allows the formation of dynamic virtual backbone used to organize media access, to support QoS and to simplify routing [8, 12]. Mainly, nodes are partitioned into clusters, each with a cluster head (CH) node that is responsible for all management and coordination tasks of its cluster. Ensuring stability is the major challenge for clustering algorithms especially in a highly dynamic environment. Thus, efficient clustering algorithms should not only focus on forming a minimal number of clusters as many existing algorithms do, but also maintain the current cluster structure and keep the overhead at the minimum level. Most of the existing VANET clustering algorithms are derived from the MANET clustering schemes [8, 13–17]. However, these algorithms lack a technique to capture the mobility characteristics of VANET nodes and fall in a major drawback of forming clusters considering only position and direction of vehicles located in geographic proximity regardless of their high relative speed. We believe that the existence of group members in the same geographic area does not mean that they exhibit the same mobility patterns, e.g., vehicles on the left lanes move faster than the vehicles on the right lanes, and thus their relative speed might be very high. Since the main goal of clustering is to make global topology less dynamic, we believe that, changes in the network topology on the global scale are directly related to the stability of local clustering structure. Therefore, in order to enhance their stability, clustering models need to be redefined so that they are characterized based on the full status elements: speed difference, location, and direction rather than considering only position and direction. Some clustering techniques took mobility into consideration for cluster head (CH) elections, but not for cluster formation. For example, when the CH leaves its cluster due to merging with other clusters or mobility, the cluster members use a CH election algorithm that considers mobility to elect a new CH out of the cluster members . In this work, we introduce a new clustering approach with the aim of increasing the stability of the network topology and making it less dynamic. This approach takes the speed difference, in addition to the location and direction, into consideration during the clustering process. But, with the inclusion of the speed difference as a new parameter, a new challenge arises as follows: how to partition the network into minimum number of clusters, such that when the clusters are finally formed, the distribution of the vehicles among them based on their mobility patterns is achieved with high probability. In short, we need an algorithm to accurately identify nodes showing similar mobility patterns and group them in one cluster. In this paper, our main contributions are as follows: first, developing a new clustering algorithm that runs on all nodes in a fully distributed fashion. This algorithm is used to divide the network nodes into clusters such that when the network is finally partitioned (clustered), the probability of partitioning along cluster boundaries is achieved with high probability. This means that vehicles with high mobility are grouped in one cluster and vehicles with low mobility are grouped in another cluster. Second, developing a new multi-metric election method that can be used by network nodes to determine their suitability to become cluster heads. The rest of the paper is organized as follows: Section 2 presents VANET clustering algorithms. Section 3 introduces the system overview and assumptions. Section 4 describes the clustering process and the protocol structure. Section 5 shows the simulation results and the performance evaluation. Section 6 concludes the paper. Several clustering techniques for VANET have been proposed in the literature. While most of these techniques focus on the media access organization for cluster members and use the MANET clustering techniques to form the clusters, none of them took speed difference into consideration for cluster formation in VANET. As a result, these techniques do not produce a stable clustering structure. Some of these proposed techniques are summarized below. In , the authors proposed the cluster-based location routing (CBLR). Nodes use HELLO messages to distribute their states. When a node enters the system, it enters the undecided state and then announces itself as a CH if it does not receive a HELLO message within a period of time from other nodes; otherwise it registers at a CH as a member node. To cope with the VANET topology changes, nodes maintain a table containing a list of the neighboring nodes with which they can exchange information. The protocol mainly focuses on improving routing efficiency in VANET. The nodes are supposed to know their position and the position of their destination and therefore, the packets are forwarded directly toward the destination. In , the authors adopted the same algorithm used in the CBLR for the cluster formation. Nodes can be members in more than one cluster. In this case they are called Gateways and used to route packets to their destination. Nodes track changes in the topology and adapt their states to the situation using two tables; one for the neighboring nodes and the other one for the adjacent clusters. When two cluster heads come into a direct communication range, one should give up its cluster-head role and merge with the other. The decision about which one keeps its state and which one loses its CH role is based on a weighted factor W v , which takes into consideration the mobility, the connectivity, and the distance to the neighbors. These parameters are multiplied by their given weights and then summed to produce the total weight W v . The smaller the W v , the more qualified the node is to become a cluster head. The work also focuses on the media access control in the cluster-based VANET environment to improve the QoS support. The time division multiple access (TDMA) technique is used to divide the medium into time slots, which are then grouped into frames. The time slots are assigned to cluster members according to their needs. Another clustering algorithm was proposed in . The proposed algorithm is basically the lowest ID used in MANET with a new modification. The authors included the leadership duration as well as the direction in the lowest ID algorithm to determine the node to be a cluster head. The leadership duration (LD) is defined as the period the node has been a leader since the last role change. The higher the leadership duration, the more qualified the node is to be a cluster head. Therefore, the cluster-head rule is: choose the node with the longest leadership duration and then choose the one with the lowest ID. The formation of clusters is based on beacon signals broadcasted by the VANET nodes. Each node announces itself as a cluster head and broadcasts this to all neighbors. If it receives a reply from a neighboring node with a lower ID and a higher leadership duration, then the node changes its state to a cluster member. When a node leaves its cluster, it looks for another cluster in the neighborhood to join. If none of the neighboring nodes or the neighboring cluster head satisfy the cluster head election rules, then the node claims itself as a cluster head. The work in  was modified and presented in . In addition to the LD and the moving direction (MD), the authors introduced the projected distance (PD) variation, which means distance variation of all neighbors over a period of time. Each node is associated with a utility weight (uW) of three parameters (LD, PD, and ID), where the ID is the identifier of the node. The LD parameter is given the highest weight. To define the total utility weight, a lexicographical ordering of the three parameters (LD, PD, and ID) is used. For example, the utility weight (LD1, PD1, ID1) is greater than (LD2, PD2, and ID2) if either LD1 > LD2 or (LD1 = LD2 and PD1 < PD2) or (LD1 = LD2 and PD1 = PD2 and ID1 < ID2). Based on this, the LD value has maximum importance and its value is the primary factor to determine the total uW. However, in both works [15, 16], the node that has higher connectivity degree might not be elected to lead the cluster if there is another node that has longer leadership duration. This will produce less stable cluster structure, because having longer leadership duration does not mean that the node has high connectivity degree that gives it the ability to lead the cluster. In , the authors proposed a distributed cluster-based multi-channel communications scheme for QoS provisioning over V2V-based VANET. The goal is supporting the QoS for timely delivery of the real-time data (e.g., safety messages, road condition, etc.) and increasing the throughput for the non-real-time traffic over the V2V networks. The formation of the clusters is implemented using the traditional algorithms mentioned earlier, e.g., when a vehicle enters the road, it checks for nearby clusters to join. If there are no clusters, then the vehicle announces itself as a cluster head and forms a new cluster. The cluster merging can happen only when two cluster heads come within the transmission range of each other. The cluster with less members is dismissed and its cluster head joins the neighboring cluster, while the other members start cluster formation process if they cannot join any nearby clusters. The proposed scheme assumes that each vehicle is equipped with two sets of transceivers, which can operate simultaneously on different channels. The cluster members use one transceiver to exchange safety messages and stay connected with the cluster head over the service channel; and use the other one to communicate with other members to exchange non-safety data. The cluster head communicates with its members via the service channel using one transceiver; and uses the other one to communicate with the neighboring clusters via the control channel. In , the authors proposed a heuristic clustering approach for cluster-head elections that is equivalent to the computation of the minimum dominating sets (MDS) used in graph theory. This approach is called position-based prioritized clustering (PPC) and uses geographic position of nodes and the priorities associated with the vehicles traffic information to build the cluster structure. For clustering purposes, each node is assumed to broadcast a small amount of information of itself and its neighbors, which is referred by five tuples (node ID, cluster-head ID, node location, ID of the next node along the path to the cluster-head, and node priority). A node becomes a cluster-head if it has the highest priority in its one-hop neighborhood and has the highest priority in the one-hop neighborhood of one of its one-hop neighbors. The priority of the node is calculated based on the node ID, current time and the eligibility function. A Node having longer travel time has higher eligibility value, and this value decreases when the velocity of the node deviates largely from the average speed. A new clustering algorithm was proposed in . This technique basically classifies vehicles into groups based on the speed range of vehicles. Vehicles that fall in the same speed group belong to the same cluster. The authors defined seven groups based on the minimum and maximum value of the speeds that the vehicles can use. The range of the speed difference is 15 kmph for all groups except groups 0 and 6, which is 30 and 10 kmph respectively. The authors adopted the "First Declaration Wins rule", which is basically a node that first claims to be a cluster-head remains as a cluster-head and rules the rest of nodes in its clustered area. According to the authors' definition, if a cluster member speed changes such that the node travels at a speed that is different from the group speed for a period of time, then, the node must update its clustering group and should seek for a new cluster even though the node is still under the transmission range of its current cluster-head. The authors proposed that the cluster-head adjust its transmission range when the density of the vehicles is very high. The cluster-head can reduce its transmission range to include less number of vehicles to reduce the management overhead. One of the drawbacks of this technique is that the first vehicle that claims to be the cluster-head may have its speed and location on the boundaries of both parameters. This cluster-head might lose the communications with its members soon. Moreover, having the cluster-head adjust its transmission range according to the speed of the group, makes the cluster members on the cluster boundary out of the transmission range of the cluster-head. Thus, these nodes will leave the cluster, which results in an increase of the cluster change rate. The authors of  proposed a cluster formation technique where nodes use the affinity propagation (AP) method to pass messages to one another. Basically, the proposed algorithm takes an input function of similarities, s(i, j), which reflects how well suited data point j is to be the exemplar of data point i. Nodes exchange two types of messages: responsibility, r(i, j), indicating how well suited j is to be i's exemplar, and availability, a(i,j), indicating the desire of j to be an exemplar to i. The nodes use the self responsibility, r(i, i), and self availability a(i, i), to reflect the accumulated evidence that node i is an exemplar. When a node's self responsibility and self availability become positive, that node becomes a cluster-head. The authors proposed that a clustering decision is made periodically every clustering interval (CI) period, and a clustering maintenance is performed in between CI. However, having cluster members make clustering decision every CI will increase the probability of re-clustering. Also the authors did not take into consideration the speed difference among neighboring nodes. In , the authors proposed a clustering technique for MANET applications. They introduced an aggregate local mobility (ALM), which is a relative mobility metric that used the received signal strength (RSS) at the receiving node as an indication of the distance between the sender and the receiver. However, the use of RSS is highly unreliable, especially in VANET environment, as indicated by other researchers . The paper  also did not take the speed difference as a parameter to form clusters. In , the authors basically uses the ALM proposed in , with some modifications, as a criterion for triggering cluster re-organization. Originally, the ALM is a relative mobility metric that uses the RSS at the receiving node as an indication of the distance between the sender and the receiver . The ratio of the RSS of two successive periodic hello messages indicates the relative mobility between the two nodes. In , the authors used the location information embedded in the periodic hello messages to determine the relative mobility of the nodes instead of using the signal strength. In this technique, if two cluster heads come into direct communication range, they exchange more than one packets in a predefined period of time in order to consider the merging between the two clusters. In case merging takes place, the cluster-head with the lower ALM value maintains its role while the other gives up its role and becomes a member node in the new cluster. However, the nodes that lost their cluster-head due to merging or mobility and cannot find nearby clusters to join, they will all become cluster heads almost at the same time. There will be a period where they will organize their minds as to who will be the new cluster-head. However, the authors did not take the speed difference of neighboring nodes into consideration. The degree of the speed difference among neighboring vehicles is the key criterion for constructing relatively stable clustering structure. Neighboring vehicles cooperate with each other to form clusters. In general, vehicles build their neighborhood relationship using the position data embedded in the periodic messages. Usually, vehicles broadcast their current state to all other nodes within their transmission range r. Therefore, two vehicles are considered r-neighbors if the distance between them is less than r. The total number of r-neighbors of a given vehicle is called the nodal degree of the vehicle. All notations used for analysis are presented in Table 1. Clusters are formed by vehicles traveling in the same direction (one way). Therefore, all r-neighboring nodes used in our analysis are limited to those vehicles traveling in the same direction. However, the speed levels among the r-neighbors vary and this variation might be very high; thus, not all r-neighbors are suitable ones to be included in one cluster, and therefore, they are not good Candidate Cluster Member. In order to build relatively stable clustering structure, vehicles should consider only r-neighbors that are good candidate cluster member (CCM). Therefore, in this work, vehicles are required to classify their r-neighbors into stable neighbors (SN) and non-stable neighbors. Two vehicles are considered stable r-neighbors if their relative speed is less than ± Δ vth. Hence, only stable neighbors of the vehicle initiating the cluster formation request participate in the cluster formation process. Note that, in (3), for a given Δvth, the pΔvvalue decreases as σΔvincreases. Thus, the expected number of stable neighbors (SN) will vary. So, in order to avoid having high variation of this number, the threshold can be set as a function of the standard deviation, e.g., Δvth = βσ. Thus, the threshold is a dynamic parameter which depends on the speed characteristics of the vehicles within the vicinity (Table 1). The stable neighbors of a given vehicle might not be stable with respect to each others; thus they can't belong to the same cluster. Therefore, in order to partition the network into minimum number of clusters such that all cluster members are stable with respect to each other (fast moving vehicles in one cluster and slower moving vehicles in another cluster), not all vehicles are allowed to initiate the cluster formation process even though each vehicle can determine its stable neighbors. In the following section, we discuss which vehicle is a preferable one to initiate the clustering process. The inter-vehicle communication (IVC) operates in the 5.9 GHz band to support safety and non-safety applications. The dedicated short range communications (DSRC) uses 75 MHz bandwidth (5.850-5.925 GHz) which is divided into seven channels. One of the channels is called the control channel, and the remaining six are called service channels . Vehicles are assumed to utilize the control channel to exchange periodic messages and gather information about their neighborhood, and use one service channel to define the cluster radius and perform all intra-cluster communication tasks. According to the DSRC specifications , the data link layer can provide a transmission range of up to 1,000 m for a channel. VANET applications can use a longer range, R, for the control channel so that a cluster-head can communicate with neighboring cluster-heads for safety message disseminations, and a shorter range, r, for a service channel that is used for intra-cluster managements. Using the control channel, vehicles can gather status information of other neighboring vehicles and then can build a complete picture about their neighbors which can even go beyond the cluster boundaries. Since in our technique, slower vehicles will be in one cluster and faster vehicles will be in a different cluster, we can start the cluster formation process either from the slowest or fastest vehicle. For example, if we start with the slowest vehicle, then all the neighboring vehicles of this slowest vehicle that satisfy the speed threshold will be in the first cluster. The remaining vehicles will then go through the same cluster formation process to create other clusters. By extracting the velocity data embedded in the periodic messages, any vehicle can determine whether it has the slowest velocity among all its neighbors within R communication range. The slowest vehicle, in our method, is supposed to initiate the cluster formation process by sending a cluster formation request and only its stable neighbors participate in this process. The neighboring vehicles whose relative velocity, with respect to the slowest vehicle, is greater than the threshold, Δvth, will not be grouped in the same cluster. The neighborhood term is directly associated with the transmission zone of the node. But, the DSRC is a multi-channel interface with different transmission ranges. Therefore, the neighborhood term needs to be re-defined according to the channel being used for the communications. To illustrate this, consider Figure 1 in which three vehicles l, m and n are located within geographical area. For node l, node n is considered a neighbor from the perspective view of the control channel, but not a neighbor from the perspective view of the service channel because the distance to l is greater than r which is the maximum range of the service channel. Node m is considered a neighbor from the perspective view of both service and control channels. Illustration of the neighborhood relationship of a given node. As nodes exchange their status information via the control channel, it would be easy for node l to identify that n is within 2r distance. Although neighborhood relationship is built using the control channel, it will be represented using r-neighborhood terminology. For example, node n is called a 2r-neighbor because it's within 2r distance. 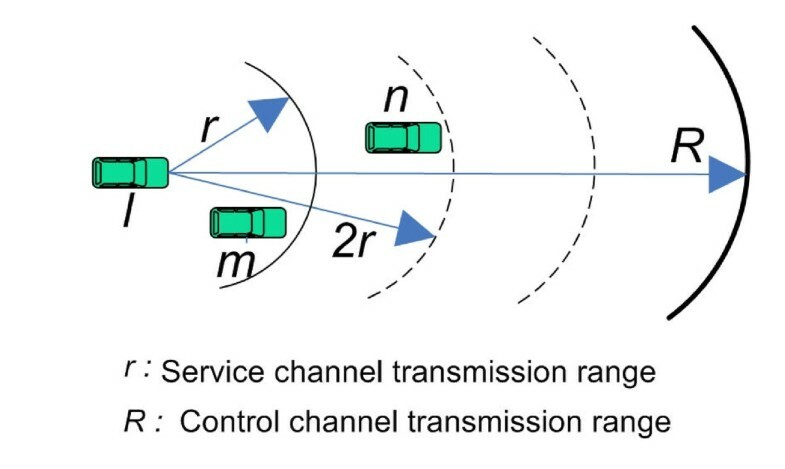 The mobility information (velocity, location, node degree, and direction) of the nodes is exchanged via the control channel whose coverage area, R, is larger than that of the service channel, r, used to define the cluster boundary (radius). The mobility information of the 2r-stable neighbors is needed for the vehicle to initiate the cluster formation request, while cluster-head election information for any node is limited to the nodes that are within r distance from the node itself. The suitability value of the vehicle is calculated by considering the mobility information of its stable neighbors only. Nodes having higher number of stable neighbors, maintaining closer distances to their stable neighbors, and having closer speed to the average speed of their stable neighbors should have higher suitability value, thus they are more qualified to be elected as cluster-heads. Where w = |pnorm| + |vnorm| and 0 < α ≤ 1 indicates the sensitivity of u to w. The higher the u the more qualified the node is to become a cluster-head. Figure 2 shows the impact of the mobility parameters on the suitability. The figure shows that the suitability of the node to win the cluster-head role decreases as the distance and speed to the d neighbors deviates very large from the mean. Suitability value, α = 1. In order to execute the algorithm, each vehicle is assumed to maintain and update the two sets Γ(t) and the Λ(t) that contain the IDs of the 2r-stable neighbors. At any time, there should be a vehicle whose speed is the slowest among its 2r-stable neighbors, and as a result, the Λ(t) list maintained by this vehicle is empty. The pseudo code of the algorithm is shown in Algorithms 1-3. The algorithm basically requires that the slowest vehicle or the vehicle whose Λ(t) members belong to other clusters originates the cluster formation process. This vehicle is called the cluster originating vehicle (COV). Line 3 in Algorithm 1, shows that COV sends the Initiate Cluster(CIDtmp) with its ID as a temporary cluster ID to all Γ(t). Then, as shown in Algorithm 2, all Γ(t) non-clustered members react upon receiving this message by setting their cluster ID temporarily to be the ID of the COV as shown in line 3. Vehicles start calculating their suitability to become a CH as shown in line 4. Then, the vehicle calculates Twait before announcing its eligibility to become a cluster-head as shown in line 5. The vehicle waits for Twait that is proportional to the suitability value of the vehicle. The higher the suitability value, the less the value of Twait. This can be seen in lines 6 through 15. If the vehicle receives a Form Cluster(CHid) message from any other vehicle that belongs to Γ(t) before its waiting time, Twait, expires, then the vehicle determines that there are other vehicles belong to Γ(t) that are more suitable to win the CH role. Therefore, the vehicle quits the competition and processes the received message. If the maximum number of iterations is used and nodes still collide, then each node picks a uniformly distributed random number between 0-9 and the one with the smaller value wins the competition. If the random numbers are the same, then the nodes will generate another pair and so on. Let s be the probability that a node will be able to announce its eligibility first time it generates a random number. The probability that a node will be able to announce its eligibility during the second time given the fact that it failed to announce during the first time is (1 - s)s. Similarly, the probability that a node will be successful during the third time given the fact that it failed during the first and second times is (1 - s)(1 - s)s and so on. The node has to generate random numbers 1 s times before it can announce its eligibility. Therefore, if the node went through i iterations using Equation 7 before it started generating random numbers, the average number of trials for eligibility announcement is i + 1 s .
Where Δv is the speed difference, and dis(n,CH) is the distance between the standalone vehicle, n, and the cluster-head, CH. The above formula can also be used when the standalone vehicle is followed by the cluster-head but its velocity is greater. This formula can also be used when the standalone vehicle is followed by the cluster-head but its velocity is less. Leaving a cluster: when a cluster member moves out of the cluster radius, it looses the contact with the cluster-head over the service channel, r. As a result, this vehicle is removed from the cluster members list maintained by the cluster-head. The vehicle changes its state to a standalone if there is no nearby cluster to join or there is no other nearby standalone vehicle to form a new cluster according to our cluster formation algorithm. Cluster merging: when two cluster heads come within each others transmission ranges and their relative speed is within the predefined threshold Δvth, the cluster merging process takes place. The cluster-head vehicle that has less number of members gives up its cluster-head role and becomes a cluster-member in the new cluster. The other cluster members join that neighboring cluster if they are within the cluster-head's transmission range and the speed is within the threshold. If there is any other nearby clusters, then vehicles calculate their RT and join the cluster where they can stay for the longest period of time. Finally, vehicles that cannot merge with the cluster nor can join a nearby cluster, start clustering process to form a new cluster according to our algorithm. An extensive simulation study was conducted to evaluate the performance of our protocol. The C++ was used to develop the simulation. In our simulation, we consider different road traffic and different network data parameters. The mobility model used in this paper is built based on the car following model presented in . In the car following models, the behavior of the car is described based on the relation with respect to the car ahead. The speed, v i (t), and the acceleration, a, of the vehicle is a function of different factors, mainly the distance, Δx(t), to the front vehicle and the speed of both vehicles at time t. In this model, the speed of the vehicle, called vi,safe(t), is computed such that a safety distance is maintained. The desired new speed vi, des(t + Δt) = min[v i ,max, v i (t) + a Δt, vi, safe(t + Δt)], whereas vi,maxis the max allowed speed, and Δt is a time step. The speed of the following vehicle is determined according to the vi,des. For lane change, the methods proposed a safety requirement that must be satisfied as follows: if (|v i (t)| L -b Δt ≤ |vi,safe(t)|L), then it is safe to change to L, where L∈ [right, left] lanes, and b is the deceleration. The equation means if the lane change is taking place, each vehicle should be able to brake with a finite b to avoid colliding with the vehicle ahead. We simulated a 5-lane per direction highway. In the simulation, we monitor 400 vehicles on a highway of 15 km length for 650 s. The arrival rate of the vehicles follows the Poison process. We simulated three types of vehicles' speed taken from statistical measurements [23–25]. The speed assigned to the vehicles follows the normal distribution with average μ and standard deviation σ as shown in Table 2. In our simulation, the speed of the vehicle is determined according to the rules mentioned above. Vehicles can change their lanes if there is a room in the next lane and the rule for lane change mentioned early is satisfied. The density of the vehicles varies between (13-21 vehicle/km/Lane) depending on the speed being used. For all simulation scenarios, the Δv th = σ, e.g., for μ = 70 km/h and σ = 21 km/h, the Δvth = 21. The performance of different Δvth values can be found in . We used different network parameters in the simulation. The data rate is set to 6 Mbps and the periodic messages are sent every 100 ms, the size of the message including the mobility information is 100 bytes. DSRC standard supports data rate in the range 6-27 Mbps . However, various members of the vehicle infrastructure integration (VII) Consortium use 6 Mbps data rate [30, 31] for road testing. Thus, we also decided to use 6 Mbps data rate. To study the performance of the clustering techniques for different cluster sizes, we used different transmission ranges for r and R. The transmission range for r was varied between 150 and 300 m, while it is between 800 and 1,000 m for R. For media access, we used the IEEE802.11 standard . We set the CWmin = 15, CWmax = 1023, a Slot Time = 16μ s, SIFS = 32μ s, and DIFS = 64μs. To show the performance of our proposed threshold-based (TB) technique, we compare it with the weight-based (WB) and the position-based (PB) methods proposed in  and  respectively. Originally, the WB method for MANET was proposed by Chatterjee et al. by introducing the combined weight metric. The algorithm assigns node weights based on the suitability of a node being a cluster-head. This algorithm basically takes into consideration the nodal degree, the transmission power, mobility, and battery power of the mobile nodes. Each one of these parameters is assigned a weight; the sum of these weights is 1. Then, the value of each parameter is multiplied by its weight and all the values are finally summed to produce the combined weight. The node with the lower combined weight is more suitable to become a cluster-head. The same algorithm was adopted by VANET clustering techniques , but without considering the battery power factor since it is not a crucial problem in VANET. 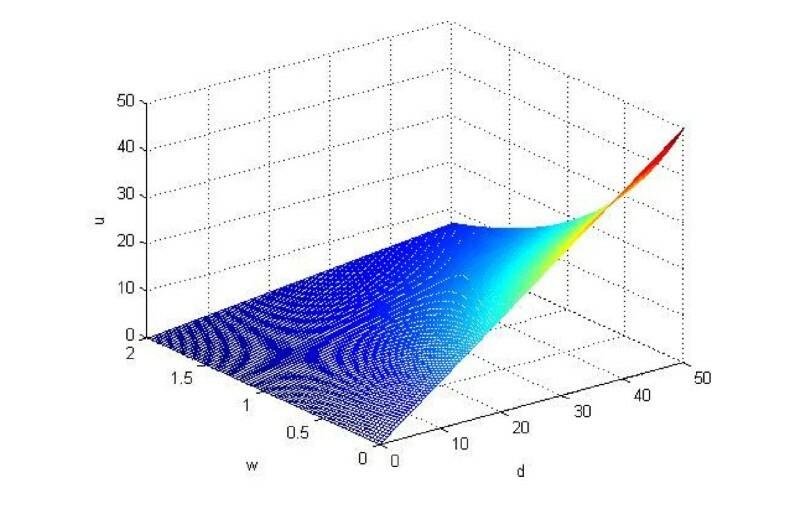 In the simulation, we assigned all WB method parameters equal weights. For the PB method, the priority of the node is calculated based on the eligibility function. A Node having longer travel time has higher eligibility value, and this value decreases as the velocity of the node deviates largely from the average speed. We compare the three methods under the same environment variables. Each simulation run was repeated 10 times with different random seeds and the collected data was averaged over those runs. e1: A vehicle leaves its cluster and forms a new one. e2: A vehicle leaves its cluster and joins a nearby cluster. e3: A cluster-head merges with a nearby cluster. Average cluster change per vehicle. where NCC i is the number of clusters vehicle i changes during its lifetime. The average cluster lifetime is an important metric that shows the performance of the clustering algorithm. The cluster lifetime is directly related to the lifetime of its cluster-head. The cluster-head lifetime is defined as the time period from the moment when a vehicle becomes a cluster-head to the time when it is merged with a nearby cluster. The average cluster lifetime produced by the TB, the WB and the PB methods is compared in different speed scenarios with different transmission ranges. Figure 4a-c shows that the average cluster lifetime is increased by 20-48% when the TB method is used compared to the WB and PB methods. This is due to the high variation of the speed difference among cluster members of the WB and the PB methods. This deviation leads to the following: first, in both methods, the probability that two cluster heads come into direct communication range is high which results in cluster merging. But, in the TB method, the cluster merging cannot be performed unless the difference between the average speed of the cluster heads of both clusters are within the predefined threshold; second, the probability that the cluster members and the cluster-head get separated soon due to high mobility; especially when the cluster is composed of few nodes. Due to high dynamics of the VANET, clusters are created (new clusters added to the system) and vanished over time, and the total number of clusters created over a period of time defines the cluster formation rate. Good clustering algorithms should be designed to reduce the rate at which clusters are created and added to the system due to the mobility of the nodes. And this can be achieved by producing relatively stable clusters and by the ability of clustering method to maintain the current cluster structure stable as much as possible. In this paper, we compare the average number of clusters added to the system, we start counting each new cluster added to the system after the algorithm is executed by all nodes and the clusters are formed (e.g., when nodes leave their current clusters due to mobility and form a new cluster, or when two neighboring clusters merge to produce a new cluster). To evaluate this metric, the total number of clusters created and added is calculated for each run, then, C avg total , of all methods is taken over all runs for different transmission ranges. Figure 5a-c shows the C avg total added to the system over all simulation runs for different speeds and different transmission ranges. The figure shows that the C avg total produced by the TB method is always smaller compared to that produced by the WB and the PB methods and this number decreases as the transmission range increases. This is because the TB method uses the speed difference among vehicles as a parameter to create the clusters. Thus, the clusters are more stable and have longer lifetime. The average total number of formed clusters for TB, PB, and WB methods. All clustering algorithms incur some additional signaling overhead to form and maintain their cluster structures. The clustering overhead consists of: HELLO packets overhead, cluster setup overhead and cluster maintenance overhead. HELLO packets are broadcast by vehicles every THELLO period. These packets carry local mobility information used to compute local variability, which will be used in cluster formation and cluster-head election. Each node sends one HELLO packet every THELLO period to maintain up-to-date neighborhood information. Thus, this overhead is the same for TB, WB and PB clustering techniques. According to the TB cluster formation algorithm, the COV node sends one message to initiate cluster formation process (InitiateCluster). After receiving this message, the node that wins the cluster-head competition broadcasts a cluster formation message (FormCluster) to its neighbors with its ID embedded in the message. So for the cluster formation process, two messages are sent: one by the COV and the other one by the cluster-head winner node. Each non-clustered neighbor that satisfies the speed threshold joins this cluster by sending a message. So in the TB algorithm, if the average number of nodes in a cluster is kTB, then the total number of messages to setup a cluster is 2+kTB. For the PB algorithm, when a new node is powered up and none of its neighbors belong to other clusters, it announces itself as a cluster-head and sends a message to inform its neighbors about its new role. Neighbors that are in the registration phase (non-clustered) join this cluster by sending a join message. So in the PB algorithm, the total number of messages to setup a cluster is 1 + kPB, where kPB is the average number of members per PB cluster. In the WB algorithm, a node that claims to be a cluster-head sends a CH-HELLO message. All non-clustered neighbors join this cluster by sending a message. So in the WB algorithm, the total number of messages to setup a cluster is 1+kWB, where kWB is the average number of members per WB cluster. In the TB technique the average number of nodes per cluster is less than that of the other two techniques. So if a TB cluster has at least two less members than the other two types of clusters, then the cluster setup overhead per cluster is less in TB technique than in other techniques. Cluster maintenance is done periodically by all clustering methods. The three types of events that trigger topology change in VANET can be defined as follows: a node joins the network, a node leaves the cluster, and two cluster heads come into direct communication range. If the new node, that joins the network, has non-clustered neighbors, then those nodes will form a new cluster according to the rules used by each clustering method. The overhead of cluster formation was explained earlier. However, if the new node has a neighbor that is a cluster-head, then it will try to join the cluster by sending a join message to the cluster-head, and this cluster joining overhead is same for all three methods (TB, PB and WB). When two neighboring clusters merge, the cluster-head with less number of members will lose its role and join the other cluster and become a cluster member. The losing node sends one message in one period to inform its members about its decision. If the losing node has cluster members, then the members are subject to cluster reorganization. The cluster members either join any nearby clusters or form a new cluster if they could not find a cluster to join. Overhead for joining any nearby clusters is the same for all three methods, and the overhead for cluster formation (cluster setup) is already presented before. The upper bound on the number of messages for cluster merging is equal to the average number of members per cluster, which is kTB, kWB and kPB for TB, WB and PB techniques respectively. VANETs are characterized by high node dynamics. Therefore, clustering methods should be designed to adapt to the VANET environment. These methods should take into account all vehicle dynamics. In this paper, we proposed a new VANET cluster formation algorithm that tends to group vehicles showing similar mobility patterns in one cluster. This algorithm takes into account the speed difference among vehicles as well as the position and the direction during the cluster formation process. After conducting a simulation experiment, we observe that our technique groups fast moving vehicles on the fast speed lanes in one cluster, while slow moving vehicles in another cluster. The simulation results show that our proposed algorithm increases the cluster lifetime and reduces vehicle transitions between clusters. The results show that our technique significantly increases the stability of the global network topology by reducing the rate at which clusters are created.